I uploaded this to Flickr earlier this week and completely forgot to post it. 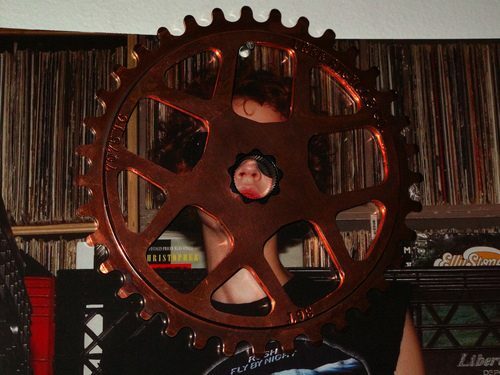 Tree copper-plated two sprockets and sent one my way. The pictures don’t do this thing justice. It’s so nice. I’m riding a 42t at the moment and this is a 36t, which is going to look substantially smaller on my massive bike. Going to put it on tomorrow, along with a 13t cog and begin to watch it patina. Can’t wait! Once it weathers, I’ll post it. It should turn a nice turquoise within a month or two.